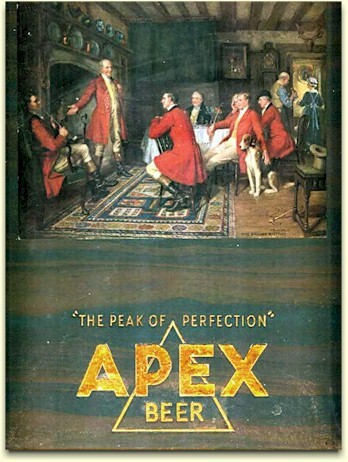 ﻿ History of the Apex Brewing Co. In April of 1933, Alvin Hemrich established the Hemrich & Western Brewing Companies - referred to as plants No. 1 & 2. Then on 14 March of 1934, Alvin established a new corporation with $40,000 in capital stock. Two months later, he completed the sale of the Western Brewing Co. (plant No. 2) to Rudolph Samet, along with the rights to the Hemrich brand. 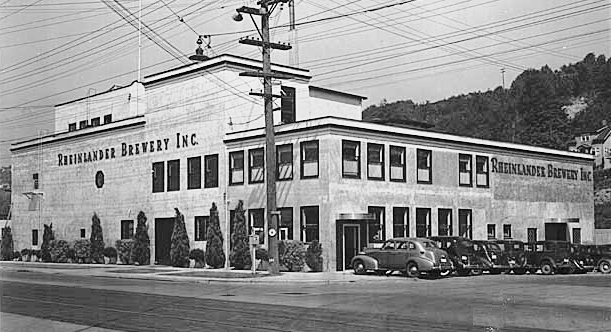 The Western plant, at 5225 E. Marginal Way, became the new Hemrich Brewing Co. and continued in operation until 1940. He then made capital improvements to plant No. 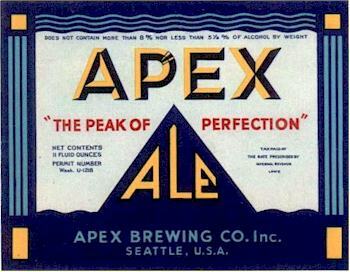 1, and in May of '34, resumed business as the Apex Brewing Company, Inc. Apex was the last Washington brewery to be issued a U-Permit number, WASH-U-1218. Plant No. 1 was just north of, and adjacent to, Sick's Century Brewery (previously the Bay View Brewery) and can be partially seen at the right in the Apex Brewery photo. Alvin was president, and his father-in-law, William Rutschow, was vice president. By this time his youngest son, Walter, had earned the position of superintendent. Unfortunately, this arrangement was about to change. Suffering a fall on icy pavement, Alvin Hemrich died from a blood clot on the 25th of February, 1935, and the following August, 57 year old, Wm. Rutschow died after a short illness. After a company restructioning, Edgar Maclay Steel became the new president, with Walter Hemrich assuming the position of vice president. Alvin's old partner in Hemrichs, Inc., Isadore Luxenburg, remained as secretary. The treasurer was Ray Johnson, and William Weiss continued as brewmaster. yet the business continued to struggled. 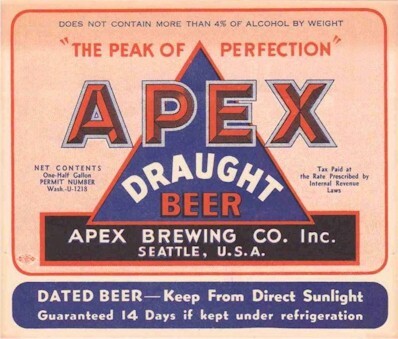 At some point the National Grocery Co. of Seattle became an investor, as a 1937 credit report showed them to own one-third of the brewery. 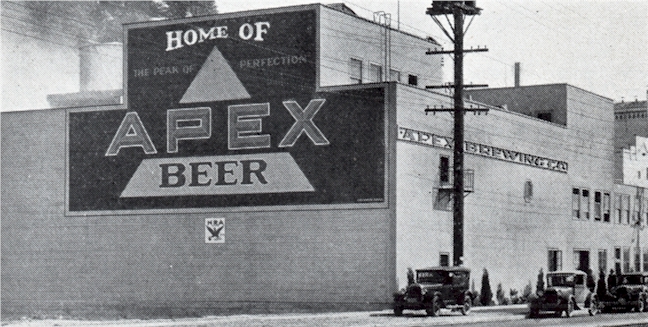 After a fatal heart attack took Walter's brother, Elmer E. Hemrich, in early '37, Walter left Apex to assist his widowed sister-in-law in the running of Gold Seal Breweries, Inc. and Hemrich Wineries Corp. of Tacoma. With the Hemrichs now completely out of the picture, the Sick organization chose to acquire the business, plant, and fixed assets of the brewery. On January 30, 1938, it was announced the company was sold, and in the following month the brewery ceased poeration. 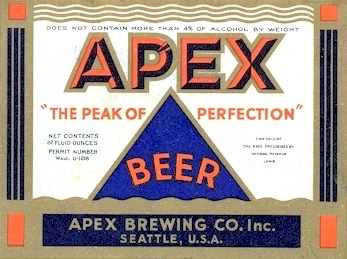 On the 4th of June, 1938, the board of directors filed to dissolve the Apex Brewing Company. Lester R. McCash, formerly secretary and treasurer of the Hemrich Brewing Company (plant No. 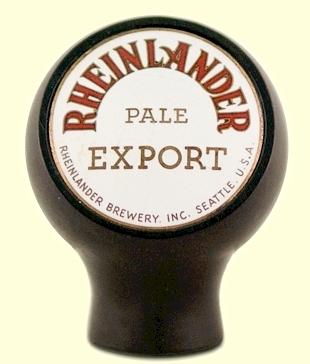 2) on E. Marginal Way, was named manager of the new Rheinlander Brewery. 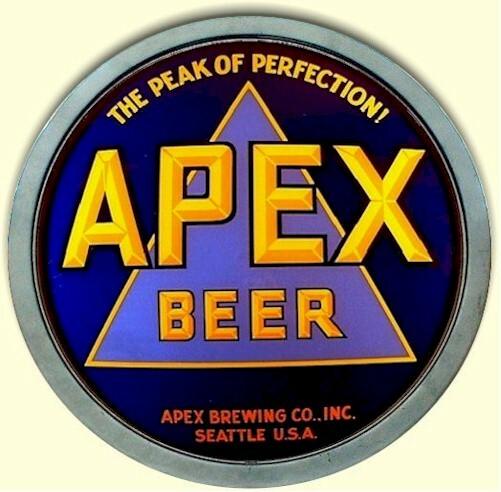 The Seattle Brewing & Malting Co. (called SeaBrew by insiders) chose not to purchase the Apex" brand, but to use the plant solely for the production of their Rheinlander beer. The adjoining Century plant would then specialize in the production of the recently acquired Rainier brand. The plant at 2918 Airport Way was now the Rheinlander Brewery, but only until May 1939, when the Horluck's Brewing Co. was purchased by the Sicks' enterprise. The Horluck plant then became the new home of Rheinander Beer, and Lester McCash moved there to serve as co-manager. The original plant No. 1 was merely absorbed into the SeaBrew complex, and used for additional storage, or cellaring. In Nov. 1948, this facility was reconfigured for an entirely different purpose. It was converted to a fully staffed and equipped central laboratory to provide constant quality control for all the breweries in the Sicks' organization, both in the U.S. and in Canada. The lab was organized by Nicholas L. Vacano, who had been the brewmaster for the Rainier brewery in San Francisco from May 1947 to Oct. '48. Vacano took over technical supervision for all the Sicks' breweries, and within four years became a director and vice president of Sicks' Brewery Enterprises, Inc. The forgoing discussion dealt with the succession of brewing activities at Alvin Hemrich's plant No. 1, located at 2918 Airport Way. While it was the home of Rheinlander Beer - if only for 11 months - this article only touched on the history of the Rheinlander brand. The following chronicles the brand's 10 year progression. "When our Century Brewery was in operation a few months, we used the brand name of "Rheinlander," which was a name we took pretty much out of thin air." 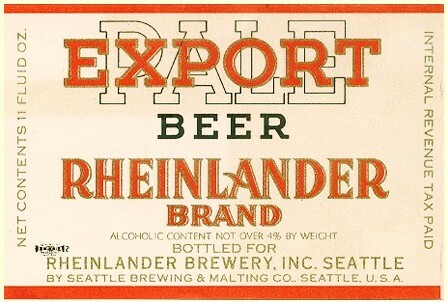 Rheinlander remained the company's flagship brand until the 1935 formation of the Seattle Brewing & Malting Company, in which the Rainier Brewing Co of San Francisco partnered with Sick, giving him the right to produce Rainier Beer in the northwest. 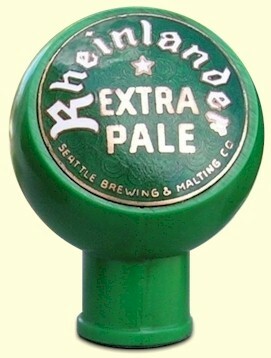 "Rainier" became Sick's primary brand, and with the May '38 purchase of the Apex Brewery, as explained above, Rheinlander production was moved to that plant the following month. 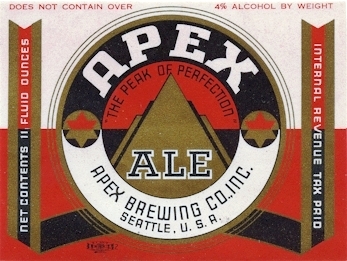 Beer & Ale labels from the 11 month stay at the Apex plant clearly state "Rheinlander Brewery, Inc."
On May 1, 1939, the Horluck Brewing Co. was purchased by SeaBrew and the plant was renamed the Century Brewery. Production of Rheinlander was then moved to the new plant which became the new "Home of Rheinlander." 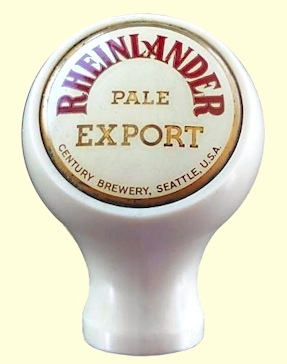 Production of Rheinlander continued until war time restrictions, and faltering sales, caused the brand to be dropped in late '42. Since the new Century plant was merely a subsidiary of SeaBrew, the beer made there didn't mention the Century Brewery on the labels, just that it was from Seattle Brewing & Malting. 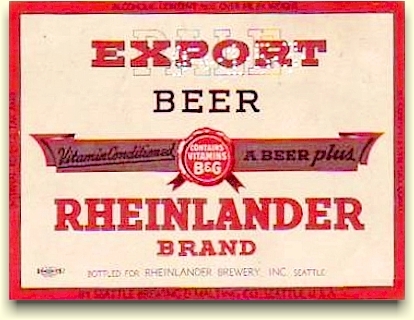 Consequently, the only clue for collectors to determine if a Rheinlander Beer label, or any item, is from either the 1935-1938, or the 1939-1942 period, is to look at the font. The early period used a Germanic font, as seen on the tap knob below (left). Thanks to Bryan Anderson for the use of the top two Apex labels. 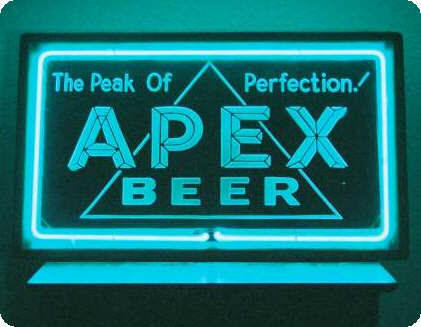 To Michael Magnussen for the images of his Apex neon sign and the ball tap knob. 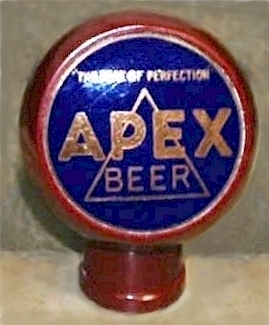 To Bob Myers for the image of the cone-top, Apex Beer can. To Nelson Murry for the Rheinlander Brewery, Inc. letterhead. And to Dale Sleeman for the image of his cardboard Apex sign. Copyright © 2005 ~ All Rights Reserved.